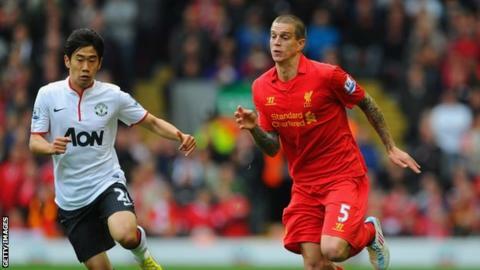 Liverpool defender Daniel Agger has signed a two-year contract extension. The 27-year-old Denmark international was the subject of strong interest from Manchester City during the summer but repeatedly stated his desire to stay. Agger is a key part of Brendan Rodgers' rebuilding plans and has now extended his contract, which was due to expire in 2014. "It means everything to me. I've never wanted to go anywhere else," Agger told the club's website. "I like the way it is going right now with the style we're playing, and hopefully the results will come soon as well. I feel I belong here and as long as the manager and the owners want me, I'll be here." The Dane, who is battling to overcome a knee problem sustained in the 2-1 defeat by Manchester United, arrived at Anfield from Brondby for £5.8m in January 2006. Managing director Ian Ayre believes Agger's new deal is significant business for the club. Ayre said: "We brought in some very exciting players this summer - some of whom chose Liverpool over clubs in the Champions League. "But it's equally important to retain your most important players and the fact that Daniel has now followed Luis Suarez,Martin Skrtel and Jonjo Shelvey in signing a new contract is testament to the fact that the players believe in what we're trying to achieve here under Brendan Rodgers."